The theme for August is Breakfast-the first and most important meal of the day..Share your favourite breakfast recipe all this month and win prizes. 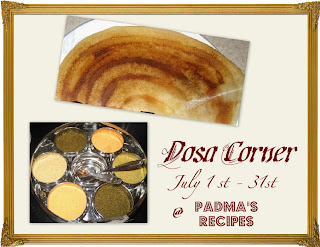 1) After posting your recipe on your blog, please link it back to this announcement and add the logo if possible. In case you wish to send some dish that you have posted earlier, please repost it with the link to the event and the logo. Please restrict the number of entries to three. to easycrafts@gmail.com by 31st Aug '09. I will pick up the picture from your blog...you neednt send it. The roundup would be published during the first week of September. Looking forward to your participation in the event. Wash the poha and drain out the water. Keep covered for 10 minutes to make it soft. Mash it well and add the rest of the ingredients except oil and mix well. Make balls of it, flatten them and fry in hot oil till crispy and golden brown on both sides. Make a thick paste of gram flour, rice flour, salt, 1/2 tsp turmeric powder, 1 tsp red chilli powder and cooking soda. Dip the paneer pieces in it and fry them till golden brown like pakoras. To drain excess oil spread the paneer on a tissue paper. Heat 2 tsp oil, add cumin seeds. When it splutters, add onion paste, ginger paste, tomato puree, red chilli powder, turmeric powder, garam masala powder, salt and mix well. Allow it cook for five minutes. Add little water to get gravy and boil for 2 mins. Add cream and mix well. Mix all the ingredients and add ghee as required to make ladoos. Healthy and tasty ladoos ready. Tamilnadu Brahmin style Marriage thali is my contribution to Shanthi's State Specials event. Mix all the ingredients for outer cover and use water to make a stiff dough. Keep covered under a wet cloth for atleast 1/2 hour. Mix all the ingredients for the stuffing and keep ready. Divide the dough into medium sized balls and roll out one of them. Cut in the center to get two pieces. Make cones from the pieces using few drops of water to seal the corners. Stuff the paneer filling and press the corners to seal the samosa. Repeat for rest of the dough and stuffing. Heat oil and deep fry the samosa on medium flame till golden brown and crisp. Drain the excess oil on a tissue paper and serve hot with sweet chutney or sauce. Make a thick batter of gram flour, rice flour, salt, turmeric powder, red chilli powder and cooking soda. Cut the papad/appalam into four or half as required. Dip them in the batter and fry in hot oil till golden brown and crisp. Remove the seeds from the bittergourd and cook them with water, turmeric, salt, jaggery and tamarind paste till soft. Use just enough water so that you dont have to drain out the excess water. Keep aside. Heat a drop of oil and roast the ingredients for filling except salt and gram flour. Cool and grind with salt to a coarse powder. Dry roast the gram flour seperately and add to the masala powder. Add a little oil to make the masala wet. Stuff these in the bittergourds. Heat about 2 tsps of oil and fry these bittergourd pieces till crisp and done. Heat ghee, add cashews and raisins. Roast and keep aside. Heat 2 cups of water and add the rava slowly. Stir till it gets cooked. Add the sugar and mix till it melts. Add milk, cardamom powder and mix well. After Potato breadizza, its time for a simple vegetable breadizza.. Spread tomato sauce on bread slices. Arrange the vegetable slices over it. Sprinkle, salt and pepper over it. Add grated cheese and sprinkle oregano powder. Cook in microwave till cheese melts or in a sandwich toaster or tava. Mix mashed potato, carrots, salt, half of the dry powders (garam masala powder, turmeric powder, red chilli powder)and bread (dipped in water and completely squeezed out) well. If the mixture is not thick like dough, add a little cornflour to it. Make balls and press in the center to make a small hole. Stuff it with grated cheese and cover again with the same mixture to get balls. These can be deep fried also, but to reduce the fat and calories, it is ideal to use the paniyaram pan with just 1 tsp oil for the whole lot. Cook till the balls are golden brown. These balls can be served as a snack for evening tea or as a starter also. For the gravy- Heat the remaining oil, add the paste and cook till oil seperates. Add salt, turmeric powder, red chilli powder, garam masala powder, water as required and cream. Cook for five more minutes. Add the koftas to the gravy just before serving. Serve hot with rotis/pulav. Wash and soak the rice for 10 minutes. Add salt, cinnamon, bayleaf, cloves, 1 tsp oil and cook the rice till soft. Divide into three portions. Heat the 2 tbsp oil, add onion, potato, cashews and fry till onions start getting brown. Add turmeric and one portion of the rice. Mix well. Grind the masala paste and heat with 2 tsp oil..Add the curd, garam masala and keep stirring till it starts leaving oil and gets thick. Add a little salt and then add the second portion of rice and mix without breaking the rice. Add cooked vegetables to the third portion and keep ready. Take a kadai, spread some fried onions in the base. Next spread a layer of the rice with yellow colour. Then spread the plain rice with vegetables as the second layer. Finally spread the third portion of rice with masala paste. Press well and cook covered on low flame for 5-10 minutes. Serve hot with raita of your choice. Heat oil, add onion and fry for 2 mins. Add ginger paste, green chilli, red chilli paste, tomato, capsicum and mixed vegetables. Add little water and cook covered till soft. Add turmeric powder, dhania-jeera powder, salt and garam masala powder and mix well. Cook till the sabzi gets dry. Garnish with coriander leaves and serve hot with rotis. Heat ghee and add the wheat flour. Keep roasting it till nice aroma comes and colour starts changing. Add 3 cups of hot water to it and mix well without lumps. Add cardamom powder, food colour and sugar to it and keep stirring till it gets thick and starts leaving the sides. At this stage more ghee can be added if required. Make a thick batter of gram flour, rice flour, turmeric powder, red chilli powder, salt and cooking soda. Peel the skin of the raw banana and cut it into thin slices lengthwise. Dip the slices in the gram flour batter and fry them in hot oil till golden brown. Use a tissue paper to drain out excess oil and serve hot with chutney of your choice. This is my second entry to WYF:Fried snack event..
Breadizza is the name decided upon for bread based pizza..Some more versions of this type of pizza will appear on the blog soon.. Spread ketchup on the bread slices. Arrange potato slices and onion rings over it. Spread grated cheese over it and sprinkle pepper powder and oregano powder over it. Grill in the microwave till the cheese melts. Alternatively you can use the bread toaster without putting up another slice over the bread to let the cheese melt. To make closed sandwiches, just cover the breadizza with another slice of bread before putting it in the toaster. 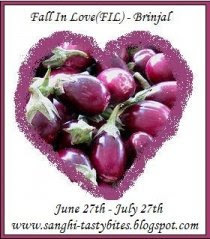 The first interview about our blogs is published by NaariSakhi under their Sakhinet segment. Thanks Naarisakhi for giving this honour and opportunity to share our experiences on blogging. Apart from the Women's Forum that covers diverse topics related to women health, beauty, food, hobbies; Naarisakhi also hosts several contests. It is a one-stop fun place where you will get all the information you require and enjoy every minute that you spend there. You are most welcome to join Naarisakhi by registering yourself there. *** For all those who were curious to know my name and have been mailing me for it, your question is answered there. This Karnataka special dish is made of beaten rice/poha instead of normal rice. Cut the carrot and beans into long pieces. Pressure cook the vegetables and dal seperately till soft. Soak the tamarind in some warm water and extract the juice. Roast the masala ingredients and grind it to a paste. Heat oil, add mustard seeds, bengalgram dal, blackgram dal. When it starts spluttering, add the curry leaves, groundnuts, turmeric powder and finally the extracted tamarind juice. Add the masala paste, salt, cooked dal, vegetables and jaggery. Let it cook for some time. Finally add the soaked poha and mix well. Let it cook for five minutes. Garnish with coriander leaves and some ghee. Serve hot with raita of your choice and chips. Soak sago in a mixture of curd and water for 2-3 hours till soft. Add the rest of the ingredients and mix well. Make medium sized balls, flatten them and fry in hot oil till crisp and well cooked. The oil shouldnt be extremely hot as it will make the outer layer dark but inner portion of the vada will stay uncooked. Waiting to see what is your favourite fried snack !!!!!! Cut the corners of the bread slices. Apply a little water to one side of a bread slice and press another slice over it. Repeat for one more slice to get a long slice of bread. Spread jam over it leaving a little space in the corners. Now roll it tightly and ensure that the ends dont open up. Tie it tightly in a cloth and keep for 15 minutes. Now cut it into rounds without breaking it. A quick idea for kids breakfast. This recipe was requested by Chitra of Ratatouille-Anyone can cook blog ..
Make a dough of maida, salt and water. Add the oil and mix well to the dough. Keep aside covered with wet cloth for 1/2 hour. Grind the carrots along with sugar without adding water. Now heat 1 tsp ghee and add this carrot paste and cook well till it gets thick and forms a big lump. Add cardamom powder and keep aside till it cools down. Make small balls of it. Make balls of the maida dough and pat it to small and thick rounds using little oil. Use a greased plastic sheet for this. Keep the carrot balls in the center. Cover it with the dough from all sides and dust it with little maida. Roll it slowly into thick chapati trying that the carrot mixture doesnt come out much. Cook this on a hot tava on low flame with little ghee till brown spots come on both sides. Make a soft dough of wheat flour, salt and water and keep covered under a wet cloth for 1/2 hour. Make medium sized balls of it. Mix the onions, cheese, bit of salt, green chillies and coriander leaves. Roll out the dough into a thick chapati. Place the filling of onion and cheese in it and fold it from sides like a square. Now dust it with some flour and roll out slowly into a square paratha. Cook on hot tava with some oil or ghee till done on both sides and brown spots appear. It would be divine to have hot cheesy parathas on a rainy/cold day..Sending these over to Shanthi for her Lovely winter recipes event..
Heat ghee and add the potatoes. Fry them for 2-3 minutes till the ghee starts seperating. Add sugar, cardamom powder, food colour and mix well till it gets thick and forms into a big lump. Transfer to serving bowl and garnish with nuts. Sending over this halwa to Nithya for the FIC:Express your mood event, a series started by Sunshinemom.